There will be six different training maps available in three training areas near Kuopio in spring 2014. The maps are varied and well suitable for Jukola training. The maps are printout maps of good quality, size A4. Control descriptions are also printed on the maps. The controls are marked with a short white plastic tube in the forest, with the control code. Training maps cost 5 euros each, and the postage. Alternatively the training maps (2) of each training area are available as OCAD attachments, 120 euros / file. There will be a weekly orienteering event on May 29th in the terrain of Kuopio-Jukola between 2 – 5 pm. 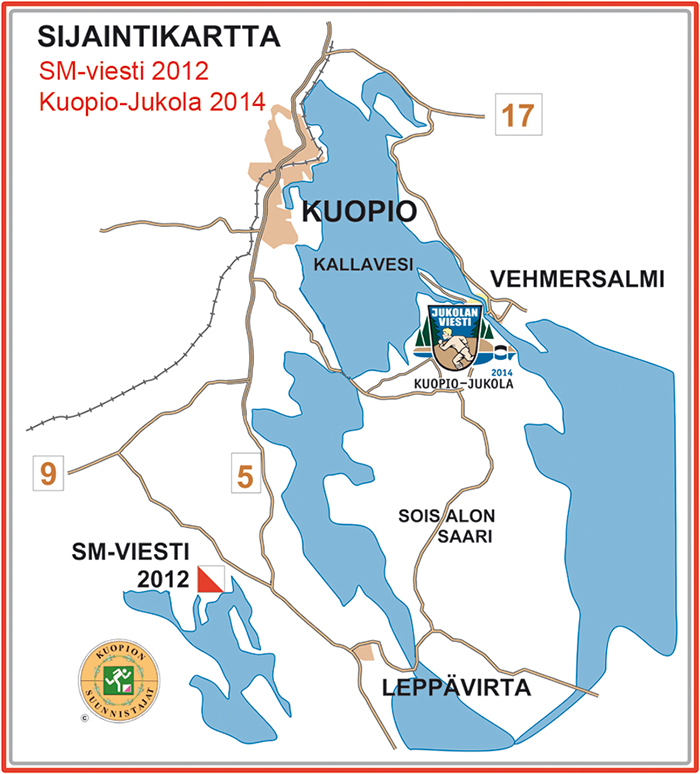 The map will be a printout map of the Kuopio-Jukola competition map. The control points will have a control buck and electronic punching in Jukola style. The controls will also be marked with reflectors so it will be possible to train at night time as well. Course lengths: A course 6,6 km, B course 4,7 km and C course 2,6 km. Start is located at the junction of Enonlahdentie and Puutossalmentie 3 km from Vehmersalmi Bridge. Limited parking space! On Friday (May 30th) and Saturday (May 31st) there is a good opportunity for training in the training areas near Kuopio. On Sunday (June 1st) there will be a national orienteering competition 30 km from the area of Kuopio-Jukola in Laitilanniemi, Leppävirta. Finnish Championship orienteering relays were held in this particular terrain in 2012. Additionally it is possible to train in Laitilanniemi, Leppävirta after the national competition (June 1st) is over. Finnish Championship orienteering relays were held in this particular terrain in 2012 and the mapping was made by Jussi Silvennoinen, who also did the mapping for Kuopio-Jukola. Model courses for Kuopio-Jukola will be made in Laitilanniemi. There are also plenty of controls for individual training in the area. The controls will be marked with control flags, without reflectors though. The map will be size A3 and the control descriptions are printed on the map. These training maps cost 8 euros each and the postage. The price of a OCAD file is 160 euros. Training in the Laitilanniemi area is forbidden till June 1st. In weekly orienteering events, which start at the end of April, it is possible to train for Kuopio-Jukola. You can find the timetable of these events at www.kuopionsuunnistajat.fi (in Finnish). Further information: info.2014(at)jukola.com. Further information and map orders: info.2014(at)jukola.fi.